If water were priced according to demand, many Westerners would be smelly and thirsty. But water is a necessity, and demand-based pricing would be unethical. Instead, many cities rely on block pricing for residential use, charging different amounts for essential water and for additional water. Done right, block pricing should encourage conservation while still letting everyone meet their needs: The cost of essential water, used for basics such as clothes washing, staying hydrated, bathing or cooking, is low, while additional water — say, for growing a lush lawn in the desert — costs more. But according to new research, that’s not the reality across the West. Economists and a public policy expert at the University of Minnesota who looked into block pricing for water in the nation’s largest urban areas, including 11 Western cities, discovered a pattern they conclude is neither sustainable nor just: Many of the driest cities have the cheapest water prices. What’s more, for households across the West, the average price of water goes down as use goes up. Phoenix, a region facing extreme risk for water scarcity, charges $27 for the first 6,000 gallons per month, the lowest price for essential residential water. 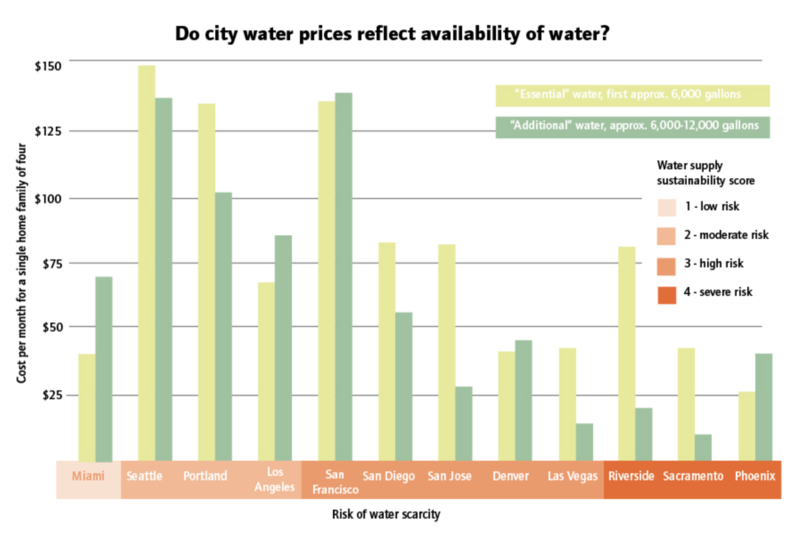 Meanwhile, the most expensive water prices are in some of the West’s wettest cities, including Seattle, which charges about $150 for the same amount. As alarming as it may be for water to cost so little in a desert city with an average rainfall of just eight inches a year, Phoenix’s water management policy is arguably more just, because necessary water is cheap, while additional water is more expensive. Phoenix charges 55 percent more for additional water use, more than any other Western city, and per capita water use has fallen in recent decades even as the city has grown. Still, the West overall has catching up to do: The greatest charge for additional water use nationally is in Miami, where nonessential water costs 73 percent more than essential water. Indeed, in almost all of the Western cities studied, water costs less on average when used more. For example, in Sacramento, a northern California city with an extreme water scarcity risk, nonessential water costs 75 percent less to use than essential water. Regulations can create a hurdle for Western cities hoping to use block pricing to make water access both sustainable and fair. In California, for example, state law Proposition 218 outlaws water prices that are higher than the cost of providing water. That rule effectively stops block pricing from being a sustainability tool, because high prices on nonessential water can’t be used to encourage conservation or to keep the price of essential water low. Meanwhile, as Western cities struggle to solve their water pricing dilemma, it’s only getting worse: Climate change is making water shortages ever more likely in the West’s most populous places, but with current policies, future water shortages will be difficult to meet in a way that’s fair. Maya L. Kapoor is an associate editor at High Country News. Email her at mayak@hcn.org.